Art. Sculpture. Bird feeder. All in one! 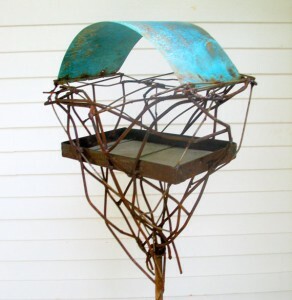 This hand crafted, beautifully intricate sculpture by Missouri artist Joe Papendick is welded from steel & copper and stands approximately 6′ tall. An “I-beam” shaped base on the bird feeder is securely welded to the upright support, and allows for placement 8-10″ deep into the ground. A stainless steel screen keeps the bird seed dry and will never rust through. A lovely verdigris copper hood gives some protection from rain, wind, and sun, and is as beautiful as the birds that will feed beneath it. I love the fine intertwining metal “branches”, and can imagine that this piece would indeed be very difficult for any bird to resist, as it will provide both a feast and a welcoming refuge. All new work currently in progress can be seen on Joe’s blog. In addition to lovely pieces such as this that deftly imitate nature, Joe has some wonderful contemporary designs, including one which was featured in the April 2011 issue of Martha Stewart Living. His earlier work was featured on the HGTV series “I Want That” back in 2006. He is also a featured Etsy seller. This precious little watercolor piece is from Welsh artist Alison Fennell’s Etsy shop Eastwitching. This 8×010 inch print is of Bertie. Alison states that he is “a real busybody and loves a cup of tea. I had fun painting his plump little body in some of my fave shades of turquoise, lime green and aqua.” Watercolors have always been a favorite medium of mine; I just love the light and translucent quality they bring to an art piece. Be sure to check out Alison’s “About” page in Etsy, to follow her interesting story about her life and art. Looking for more whimsical animals? She has many, many to choose from, so have fun browsing! The high resolution and quality of these prints on archival authentic Epson Radiant White paper makes them almost impossible to tell apart from an original. They are packaged in a clear cello sleeve (including certificate of authenticity) with a piece of rigid cardboard for stability, then placed in a sealed waterproof plastic mailer for complete shipping protection. Even if you don’t have your own garden, you can have one now with these contemporary wall murals by Estsy shop Cuma. 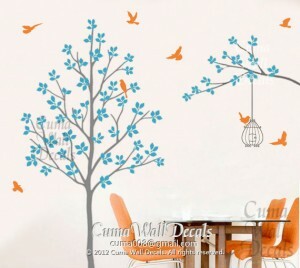 Created with the very best vinyl decal material, these look super easy to put on the walls of your home, and are easy to remove should you want to change the decor of the room at a later date. Decals won’t damage the paint but cannot be reused. All the wonderful designs on the site are made by Cuma, can be custom made to different sizes upon request, and are offered in a wide range of colors. Be sure to see all the offerings on the Etsy site with examples of the decals used in different type room settings including nurseries, childrens’ playrooms, offices, dining rooms, and bedrooms. The decals offer a quick and easy way to change the entire look of a room, or conversely, you could quite literally build your room around them! This entry was posted in Etsy, Garden, Pets and tagged art, Bird Feeder, Birdcage, Birds, Budgie, Cuma, Eastwitching, Etsy, Etsy Friday, garden, Joe Papendick, Metal Sculpture, Parakeet, Room Decor, Trees, Vinyl Sticker, Wall Decals, Wall Mural, Watercolor. Bookmark the permalink. 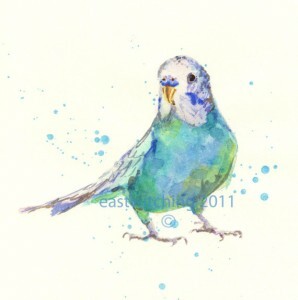 I love the parakeet watercolor!